Maxim Lin's creation, a head and shoulders image of the six-time Super Bowl champion made out of 999 cubes. 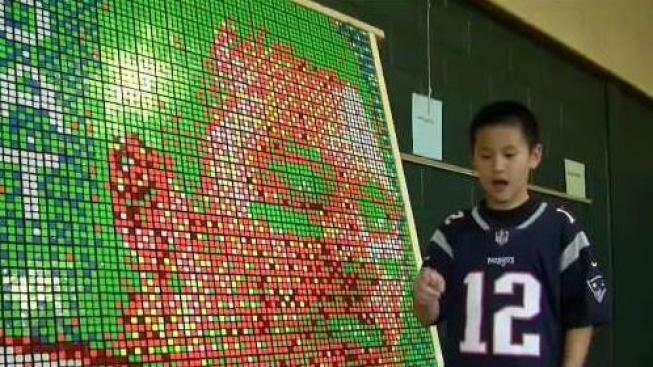 A Massachusetts fourth-grader has built a mosaic tribute to New England Patriots quarterback Tom Brady entirely out of Rubik's Cubes. Maxim Lin's creation, a head and shoulders image of the six-time Super Bowl champion made out of 999 cubes, took about two months to complete and even longer to plan. It's encased in a 7 feet tall by 5 feet wide wooden frame the 10-year-old Westwood boy built with his father. Max, who can solve a Rubik's Cube in about 13 seconds, says the puzzle cubes and Brady are two of his favorite things, so the project made perfect sense. He made the mosaic for Sheehan Elementary School's STEM fair this week. Lin says he'd like Brady to sign the mosaic, so he can sell it, and donate the money to his school.